In the New Forest, grey squirrels are widespread and often abundant in both broad-leaved and coniferous woodlands. Grey squirrels can be seen aloft throughout the year, clinging to the slenderest of branches, leaping improbable distances and amusing onlookers with their antics. They are often incredibly tame, regularly waiting around woodland car parks for picnic leftovers and food put down for birds; and when autumn’s bounty of acorns and beech mast thuds to earth, the squirrels can often be seen burying a proportion for later use. 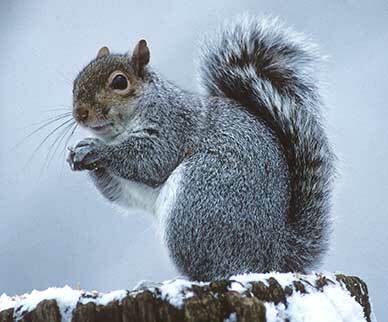 Yet whenever a grey squirrel feels threatened, it will quickly adopt what appears to be a mixture of inquisitive and aggressive posture, sitting upright on its haunches; bushy tail, flicking agitatedly, curled up its back; whilst continuously spitting noisily towards the source of its displeasure. Needless-to-say, grey squirrels are predominantly grey in colour, but, particularly in summer, show distinct chestnut patches along the flanks. Cold, winter snaps might encourage a period when grey squirrels stay at home, cosy in tree top dreys or trunk cavities, but they do not hibernate for it is at this time that autumnal prudence and intelligence are rewarded as they search out their cache of stored foodstuffs. Some of the buried treasure, though, is never found, and these acorns and beech seeds go on to germinate and grow, laying the foundations for a future generation of magnificent forest trees. Grey squirrels have one or sometimes two breeding seasons each year – in mid to late-spring, and, if well-fed, in early to mid-winter, too. Grey squirrel dreys are ball-shaped constructions made of twigs and leaves, placed high in the branches of broad-leaved trees, usually away from the main trunk; or inside a tree cavity. Provisioned with a lining of dry leaves, grass and moss, they make a cosy refuge for both adult and young squirrels. Breeding dreys are prepared by the female alone – she drives off the male soon after mating. Sometimes an old drey is carefully renovated, or a new one started. Typical litter size is three, and the youngsters, known as kittens, are born blind, naked and deaf. Each weighs only around 15 grams (½ oz). Weaned progressively from seven weeks of age, by ten weeks they are ready to emerge from the drey, and after a further three weeks start to make their own way in the world. But grey squirrels are not universally popular. In fact, they are often not too popular at all. A habit of plundering birds’ nests counts against them, whilst they are a menace in broad-leaved woodlands, compulsively stripping bark from beech and oak so as to obtain access to the juicy sap layer below. 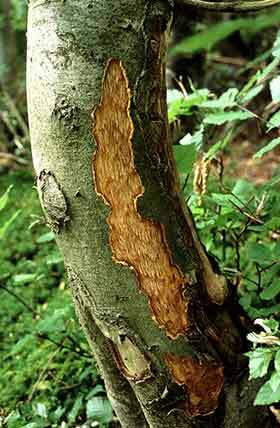 Affected trees die back if the squirrel has taken the bark from right around the trunk, whilst otherwise, at best, growth is severely restricted. In the New Forest, substantial numbers of squirrels are sometimes culled. Drey-poking has been used to some effect, whilst trapping and poisoning have also been employed. But subduing on a long-term basis these prolific breeders and ready travellers is a labour intensive, difficult and expensive undertaking.